The Fourth of July is rapidly approaching. For many Americans that means a long holiday weekend and maybe a nice barbecue with the family. It should mean more. It's ironic that a country that is a beacon for freedom and liberty around the world is taken for granted by so many of its own citizens. We who were born Americans too often believe that the rights and freedoms we enjoy are our birthright. We lose sight of the struggles of those who came before who fought and died for these freedoms. The America we know was forged in a crucible of conflict, from the Revolutionary War and all the wars fought since to preserve the ideals on which our country is built. The notion of "liberty and justice for all" was born in America and lives on today because brave people gave their lives to preserve it. I'm not naive enough to believe our country is perfect. Justice and equality came more slowly for some than others; for some the struggle continues. What I do believe is that no country has done more to live by the ideals that earmark a great and enlightened society than America. We may stumble at times, even lose our way, but the inexorable march toward liberty and justice for all never comes to a halt. Americans are free to practice the religion of their choice, live where they choose, speak their minds, even openly criticize their leaders, because these rights are protected by arguably the greatest document ever written, the Constitution of the United States. The measure of America's greatness is the number of people risking all to get into this country. The number leaving is a whole lot smaller. I've written at length about the brave immigrants, including my own ancestors, who left their homelands to come to America. I've spoken about the courage it must have taken to leave behind all that was familiar to come to a place that was unknown to them. There is another viewpoint on that. In so many interviews I've seen and read about, with people who immigrated to America, they don't talk so much about running away from something as running to something. Their voices fill with emotion as they recall how their hearts nearly burst with joy on seeing the Statue of Liberty when they entered New York harbor. Many knelt and literally kissed the ground of the country they were so happy to be entering. I think sometimes we native-born Americans need to step back and look at our country through their eyes. Ken Burns recently put together a documentary on how the Statue of Liberty came to America as a gift from our sister republic, France. Sculptor Frederic Auguste Bartholdi was commissioned to design a sculpture with the year 1876 in mind for completion, to commemorate the centennial of the American Declaration of Independence. The Statue was a joint effort between America and France and it was agreed that the American people were to build the pedestal, and the French people were responsible for the Statue and its assembly here in the United States. However, lack of funds was a problem on both sides of the Atlantic Ocean. In France, public fees, various forms of entertainment, and a lottery were among the methods used to raise funds. In the United States, benefit theatrical events, art exhibitions, auctions and prize fights assisted in providing needed funds. Joseph Pulitzer (noted for the Pulitzer Prize) opened up the editorial pages of his newspaper, "The World" to support the fund raising effort. Pulitzer used his newspaper to criticize both the rich who had failed to finance the pedestal construction, and the middle class who were content to rely upon the wealthy to provide the funds. He said that the statue was not a gift from the millionaires of France to the millionaires of America, but from the people of France to the people of America. Pulitzer's campaign was successful in motivating the people of America to donate. Over $130,000 was raised, much of it from donations of one dollar or less. The Statue was completed in France in July, 1884 and arrived in New York Harbor in June of 1885 on board the French frigate "Isere". The Statue was re-assembled on her new pedestal in four months time. On October 28th 1886, the dedication of the Statue of Liberty took place in front of thousands of spectators. She was a centennial gift ten years late. Is the imprisoned lightning, and her name, Mother of Exiles. “Keep, ancient lands, your storied pomp!” cries she with silent lips. Take a moment out from your busy holiday weekend and thank God that you were born in the greatest country the world has ever known. Happy Fourth of July. Since good things come in pairs, and you've already met Raymond in my last post, let me introduce his better half, Isabelle. My mother-in-law, "Belle", was born in 1914 in Brooklyn to Italian immigrants Francesco and Matilda Corsano. Bell had two sisters (Laura and Louise) and a brother (Matty) who grew up during the tough times of the Great Depression. I've written in earlier posts about how, when Francesco was hurt and out of work a local baker delivered bread to their home every day and never asked for a penny. The family struggled, sometimes making a meal of sugar sandwiches because there was nothing else to eat. This was in the days before the government became responsible for everybody, and neighbors tried to help one another. From the pictures I've seen, Isabelle was a pretty, vivacious young woman who loved to dance and have a good time. I never cease to be amazed by the people who survived the Depression and the generally upbeat take they have on life. Belle was like that; maybe living through such hard times makes you want to laugh that much more when it's over. Before it was common for women to enter the workplace, many young girls learned to sew as a way to make a living. Belle was a skilled seamstress who made all her daughters' clothes because there simply was no money to buy them. You would never know from looking at them that they were not store-bought. Belle could take a set of old curtains and turn out a dress, two blouses, a couple of hats and the upholstery for a 1949 Dodge sedan. She was a gifted cook as well. When it came to be her turn to host the Sunday afternoon dinners, as it did for most Italian-American wives back in the day, Belle stepped up to the plate (no pun intended). I never gave much thought to how much work this was until my wife and I began having these dinners in our home. I showed up every week with my appetite and never thought about how that delicious food got on the table. (I'm really sorry about that, Mom). Belle had her special dishes like Braccioles in a brown gravy, Easter Pie, and an escarole pie to die for. We recently saw on TV an episode of "Lydia's Italy" on which she was featuring dishes from around Naples. One of them was escarole pie. I know it was a warm moment for my wife Jasmine to see the dish so well prepared by her mother and grandmother being lauded by Lydia. Isabelle, although poor growing up, always had an eye for art and culture. Her home was filled with art prints and antiques she had picked up with whatever money she could squeeze out of the household budget. She enjoyed travel and seeing places she had only read about. Ray, her husband, did not share her love of travel, and this greatly cramped her style. The boundaries of Ray's travel horizons stopped at the Poconos. Belle was able to browbeat him into a few excursions on Tauck Bus Tours to local destinations, but that was it. Exasperated, Belle teamed up with her sister Louise for a trip to Europe. We drove them to the airport and Ray worriedly waved goodbye, not so much because he was sorry to see his wife go, but because he didn't know if we would find a parking spot near the house when we returned. Belle loved Broadway and in her younger days frequently traveled into Manhattan to the theater. Broadway plays ranked just below travel on Ray's list of things to do, so Belle went with Aunt Julia or Aunt Lou. She also had a flair for decorating, and would use her imagination and sweat-equity to create things for the house she couldn't afford to go out and buy. Once she decided to remodel some dining room chairs she didn't care for, and cut out the wood back supports with a hand saw and caned the chairs instead, because that was what she wanted. Did I mention she was also a talented artist who created some lovely watercolors that still hang in our homes today? She never had any art training; she just knew that painting was a cultured pastime and made herself good at it. Isabelle was a very canny lady who had mastered the womanly art of letting her husband believe he was in charge. Ray would rant and wave his arms around, but in the end, did what his wife wanted. It's fashionable for comics to make mother-in-law jokes, but I was lucky to be blessed with in-laws who became my second parents. They were good hearted, hard working, family loving people who did so much to set the example for what parents and grandparents were supposed to be. My children are better for having been around them; I know their memories of Ray and Belle are happy ones that will not soon fade. Maybe the best thing they ever did for me was to bring their daughter Jasmine into the world. Of all the partners I might have chosen, none but she could look past my flaws and love me in spite of them. So thanks for everything Mom and Dad...we will do our best to pass forward your values. If you Google "Raymond Salamo" the only hit is the Social Security Death Index showing his birth date, March 1910, and the date of his death, February 16, 1998. What you won't find is the story of the man who, as well as any, represents his generation and his Brooklyn-Italian roots. Ray was my father-in-law and quite an interesting guy. He was gruff on the outside, and did not accept people easily, but once you passed muster, you couldn't ask for a more loyal friend. When Ray pronounced you as OK, he began to let down his guard and show the funny, kinder side of him that those on the outside never got to see. Instead, they got what came to be known as "the Salamo look", a penetrating stare that froze people in their tracks. The look was a family thing that all his siblings, and even his children at times, could produce, but Ray was the consummate practitioner. Ray was born Erasmo Salamo in Brooklyn, New York in 1910, the same year as my father (View "Tony Boots"); 1910 must have been a good year for characters. Erasmo became 'Ray' early in his life, probably because Italian-Americans worked hard to blend in back then, almost to the detriment of their Italian heritage and culture. They embraced all things American including the English language. Children were encouraged to learn English, and in many homes of immigrants, Italian was not spoken except when they didn't want the kids to understand what was being said. Ray came from a large family of eleven children, six boys and five girls, raised by his parents, Gelsomina and Vincenzo. They lived at various locations around South Brooklyn in the vicinity of Columbia and Hicks Streets. There was nothing Ray enjoyed more than reminiscing about those days. If he was in a grumpy mood, we learned to steer his thoughts back in time, and soon he was a different man, animated and happy, as he spoke of remembered adventures with his good pal Mike Sasso. Mike was a bear of a man with the sweetest disposition...that is until he became angry. Then you wanted to give Mike a wide berth or risk some emergency dental work. Mike met and eventually married a lovely girl named Betty Menkel. Betty's father Charlie owned a bakery on Hicks Street in Brooklyn, and Ray and Mike helped out around the store. Charlie must have been quite a character too because the minute his name came up, Ray began to chuckle like a boy, not something he did easily. In 1940, Ray married Isabelle Corsano and soon two daughters, Jasmine and Paula, graced the world. The family residence was an apartment in Park Slope, Brooklyn on Union Street near Eighth Avenue, later a haven for hordes of Yuppies who coveted the beautiful brownstones that lined the streets. Ray's parents and unmarried siblings lived a few doors down in a home that became the center of Salamo family life. Grandma Gelsomina always had the gravy simmering and the macaroni boiling for Sunday dinner Italian-style. When I was courting Jasmine, I had the pleasure of attending some of those meals while Grandma and Grandpa Salamo were still with us. The decibel level was high, with conversations covering a wide range of topics as the dishes were passed around. These Sunday dinners were and are the core of Italian-American family life. They established our identity and our connection to one another, transcending time and place. Ray was the straight man for Uncle Ralph Esposito, another great character of that generation who was married to Isabelle's sister Louise, thereby becoming Ray's brother-in-law. Ray and Ralph became a comedy team, with Ray underplaying the long-suffering Bud Abbot role while Ralph reveled in being the outrageous Lou Costello. At family functions they would go into their act. Uncle Ralph unpacked his props, wigs and gadgets and soon the skits would begin. Their best audience of course was their kids, and later their grand kids, who would giggle at their corny antics. They were the life of every wedding and dance they attended, and you couldn't help wonder how two children of the Great Depression had learned to laugh so easily, and to share their gift so readily. Ray was a man set in his ways. Change was his enemy. When the house he lived in for most of his adult life was sold, and the new owner wanted Ray's apartment vacated, Ray fought kicking and screaming into the ranks of first-time homeowner. His daughter Paula and her husband Arthur had just bought a house in the Windsor Terrace section of Brooklyn. The house next door happened to be vacant, and grudgingly, Ray bought it. It turned out to be the best investment he ever made, but he'd never admit that. Regardless of what was said, his first instinct was to disagree. If you made him do something he did not want to do, he'd always find a way to let you know, for example, if you invited him to the beach (not one of his favorite places) he'd go, but keep his shoes and socks on as a way of reminding you he didn't want to be there. Ray was the ever-present sentry at the second-floor window when I took Jasmine home from our dates. I know he couldn't see us down in the doorway, but I could feel the heat from his eyes, and so our good nights tended to be brief. When I asked for his daughter's hand in marriage he couldn't be more gracious and accepting of me. Ray and Isabelle helped us throughout their lives. They didn't interfere, but we knew they were there, standing by to do whatever we asked of them, and sometimes quietly doing without being asked. Ray's wants were simple: to be able to find a parking space near the house; for the Yankees to make it to the post season; and for his children to be happy. As I grow older and grumpier I sometimes feel like I'm turning into Ray Salamo. Knowing the kind of man he was, if I could ever live up to the example he set, I would be content with that. My grandfather on my mother's side, Pasquale Camardi, could have been the poster boy for "American Immigrant" magazine. One of the regrets in my life is that I wasn't smart enough to sit down with Grandpa when he was still alive to hear the stories of his travels from Grassano, Italy to America. I would have asked him what life was like in the old country, and what made him leave all that was familiar to risk a new life in a foreign land. With help from the Immigration Records Center at Ellis Island, and assisted by the charming written recollections of my Uncle Mike (Grandpa's youngest child) I was able to tie together some pieces of Pasquale's life. When I was a kid, Grandpa was just a nice old Italian man who didn't speak much English and always wore white shirts and grey cardigan sweaters. Who knew then that when I grew up Grandpa's real worth as a man would sink in to the point that he would become my hero. Pasquale came from a small town in southern Italy called Grassano, in the Privince of Matera in the region of Basilicata. I don't know if it had any influence on Grandpa's decision to leave Italy, but in 1908 there was a horrific earthquake that hit the area just south of Grassano. Hardest hit were Messina, on the northeast Sicilian coast, and Reggio di Calabria, in the province of Calabria on the Italian mainland. From all accounts, both cities were completely destroyed and reduced to rubble. The devastation caused by the earthquake was amplified by a tsunami that shortly followed, engulfing the coastlines on either side of the Straits of Messina, striking with waves exceeding 20 feet in some locations. Coincidentally, Grandpa made his first trip to America on March 31, 1908 sailing on The Brasile, but I'm guessing that it was more the economic hardship that prevailed in Italy at the time rather than earthquakes and tsunamis that motivated the move. Pasquale made a second and final trip to America on May 1, 1912 on the ship San Guglielmo. He was followed by his wife Caterina on September 6, 1912 who traveled for some reason under under her maiden name of Schiavone, with their daughters Anna and Mary, on the ship Sant’ Anna. Interestingly, on the ship's manifest, Anna and Mary's last name was mis-spelled as "Amardi" instead of "Camardi." Because of the mis-spelling I never would have located their immigration records if I hadn't checked under the name of Schiavove. The family settled in Brooklyn, moving into a cold-water flat on Dean Street, between Rockaway and Hopkinson Avenues. In this same cold-water flat another daughter named Frances (my mother) was born on February 22, 1915. Pasquale provided for his family by working as a laborer in laying sewer pipes in Brooklyn. Caterina, who was an excellent seamstress, worked at home, sewing by hand the linings in men’s coats and jackets. The cold-water flat contained a cast-iron stove located in the kitchen. The stove burned wood and coal and was used for heating the flat and for cooking. To save money, Pasquale got up every morning at 3:00 AM and walked along the Long Island Railroad tracks in Brooklyn picking up coal that had fallen off the train cars hauling coal to the freight yards. He used what coal he was able to gather to heat the flat. Caterina, in between sewing jobs baked bread and pasta, bottled tomato sauce, made and preserved sausage, made her own root beer and sarsaparilla and later on, home brewed beer and also prepared every meal for the family. Soon after Frances was born, Pasquale and Caterina left Brooklyn and settled in Camden, New Jersey. With the little money they had saved in Brooklyn they were able to purchase a brick row house at 440 Clinton Street, Camden. In 1917, a son was born to Pasquale and Caterina. They named him Michael. Sadly, Michael passed away in 1919 at age two. He died of diphtheria. In 1923, another son was born. They also named him Michael (Uncle Mike) born on May 4, 1923. During their stay in Camden, Pasquale worked as a craftsman doing carpentry and as a steam fitter. Caterina was still working at home sewing garments. In 1926, Pasquale and Caterina moved back to Brooklyn where they rented a cold-water flat at 103 Hull Street (between Hopkinson and Rockaway Avenues). During this time, Pasquale worked for the Brooklyn Union Gas Company. Caterina was still taking in home work as a seamstress. In 1928, Pasquale decided he wanted to quit his job at Brooklyn Union Gas and go into business. With the few dollars Pasquale and Caterina had saved over the years, and whatever small profit they gained from the sale of their house in Camden, Pasquale opened a men’s hat cleaning and blocking shop located at 475 Sumner Avenue, Brooklyn. The shop not only provided a hat cleaning service, it also sold new men’s hats or fedoras from such brand names as Stetson, Knox, and Dobbs to name a few. It also had a five-chair shoe shining section. The business proved to be quite successful, and in 1950 Pasquale decided to move his store to a new location on Rockaway Avenue near Fulton Street. I remember the store at the new location. It had a wonderful smell from chemicals used to clean the hats, and from leather and shoe polish. Grandpa seemed like another man at his place of business. At home he didn't say much, relaxing by watching wrestling matches on TV and yelling at the villains on the screen as if the faked matches were for real. At the store, he was much more animated, greeting customers, giving orders to his crew, and generally fitting the mold of the successful entrepreneur. Pasquale, like so many immigrants, came to America to work, to become an American citizen, and to make a better life for his family. Unlike today's illegal immigrants who sneak into America to take what this country foolishly gives them for free, Grandpa and his generation came to America to give. They built this country and became a proud part of it. Grandpa, if you're listening, you made us who we are, and so we honor you. My brain cells are burning out at an an alarming rate, and this takes a toll on my memory. There's a lot of stuff rattling around in there, but I can't always bring up the information I'm looking for, kind of like a five-year old hard drive with too many saved files and viruses. Interestingly, as I get older, I can often recall words and images from sixty years ago more easily than the current stuff. For example, I can sing the words to most advertising jingles from the 1950s without a hitch. I can also look at old "collector" cars as they roll out for sale at the great Barrett-Jackson TV auctions and identify the make and model of most American cars from 1950 to 1960. When our stickball game got interrupted by a car cruising down the block, we used to compete to see who could identify it first. Sometimes I'll hear the words to an old song or see an image that immediately transports me back in time. For instance, the sound of the Flamingos singing "I Only Have Eyes for You" (The Flamingos – I Only Have Eyes for You) finds me as a shy teen standing on the dance floor of our local church-sponsored confraternity dances trying to work up the nerve to ask a girl across the floor to dance with me. I had to make the most of the slow dances because I never learned to do the swing or Latin dances until later in life, so my opportunities were limited. What if she said no...was there a longer, sadder walk in life than the one back to your smirking friends after getting shot down. It was an art trying to improve your chances of success, maybe with a tentative smile or encouraging eye contact, but there were still risks. I can feel the back of my neck getting hot just thinking about it. Once in a while I'll see footage from an old Dodger or Yankee game that takes me back to Grim's Tavern. Bob Grim was signed as an amateur free agent by the NY Yankees in 1948. His Major League debut was on April 18, 1954 for the Yankees. He wore uniform number 55 during his entire time on the team. He won 20 games (the first Yankee rookie to win 20 since 1910) and lost only 6 that year, with a 3.26 ERA, and was voted American League Rookie of the Year. Grim opened a bar, which as I recall was on Broadway in the Bushwick section of Brooklyn. His father ran the place and was friends with the father of Tommy Dowd, a pal of mine. This connection got us into the cool, dark interior of the bar for Cokes, and once in a while we got to see Bob Grim, later in his career, serving up 15-cent beers to the neighborhood philosophers. I'll be driving on the Belt Parkway from Brooklyn to Long Island passing familiar landmarks, and suddenly it's 1953 and I'm in Uncle Nick's car with my cousins pressed in around me in the back seat. We're heading out to Alley Pond Park in Hempstead (a major trip for us then) for a picnic Italian style. For most people, picnics mean hot dogs, hamburgers, potato salad and corn on the cob. For us, it being Sunday and us being Italian, that meant lasagna, meatballs, sausages and braccioles and THEN hamburgers and hot dogs. Picnics were special because it got kids and adults outdoors together for group games, a rare chance to play softball, horseshoes and of course bocci. While it was meant to be play, some of the men were very competitive and it wasn't long into a spirited, noisy game of bocci before the ruler came out to see who had rolled his ball closest to the "baleen". Smells too, trigger memories. Whenever I go to a street fair and get a whiff of the frying zeppoles, it reminds me not only of the great street feasts that were held in the neighborhood, but of Christmas Eve at Grandma Camardi's. We were probably one of the few Italian families that did not do the traditional seven fish dinner on Christmas Eve. Instead, Grandma and her daughters baked homemade pizzas and fried up a batch of zeppoles sprinkled with powdered sugar. For the latter they rigged up on the stovetop a metal basin filled with sizzling hot oil into which they allowed the children to form their own zeppoles out of stretchy dough and drop the donut-shape d delicacies into the hot oil. This is not an activity you will find on the "Fun Things for Kids to Do at Christmas" list, but we never lost anybody. Growing up I never thought of my childhood as remarkable, in fact it seemed quite ordinary to me. We played the games kids had always played, visited Coney Island, relished a trip to the Horn and Hardart Automat, and spent a lot of time with our families and extended families. We got through school, found a job, got married and had kids...that was the template for life and we pretty much followed it. Off in the future were lurking such issues as the struggles for women's equality, equal rights for minorities, gay rights, scandals in the Catholic church, the omnipresent welfare state, Woodstock, civil disobedience, Viet Nam and Islamic fundamentalist terrorism. In light of how uncomplicated my childhood seems in the rear-view mirror, I have decided in many ways that it was remarkable and one I almost wish I could guarantee for my children's children. "Thank God Almighty, Free at Last"
It seems to me that back in the Fifties we had a lot more freedom than kids do today. We walked a mile to school unescorted, ran errands in the neighborhood by ourselves, went to the movies with friends and rode our bikes far and wide. We played on the streets for hours every day without parental supervision. Granted it was a different time, but certainly not without risks. I just think kids were given credit for having some common sense and the ability to get by on their own. Also, there were watching eyes everywhere including nosy mothers who stayed home to raise their kids, and cops who walked a regular beat and who had no reservations about straightening out any kid who stepped over the line. Just the same, we used our freedom to do some pretty stupid things. We played ball games in the street every day the weather permitted. Money was scarce, so whenever a ball (a Spaldeen of course) wound up behind a fence or on a roof, we thought nothing of retrieving it. Spinners, a local supermarket, had a loading dock behind the store in the middle of our block. It was enclosed by a tall, wrought iron fence. At either end of the fence were two brick towers to which the fence was anchored. We couldn't climb the iron fence because it had nasty, pointed iron bars, but the towers were scalable. The main obstacle was that the towers were topped with barbed wire and broken glass. Despite these hazards we regularly took turns climbing carefully over that fence to recover our ball and then resumed the game. Big risk for a 15 cent ball but we were young and willing. We grew up at a time when smoking was considered cool. Many of our parents smoked and we couldn’t wait to try. Having no money to buy cigarettes (store owners thought nothing of selling them to you if you could pay) we came up with a solution. We each bought 25 cent corn cob pipes. Our little band of Huck Finns would walk to Highland Park blocks from prying eyes and light up. For tobacco we would pick up cigarette butts from the street, strip away the paper, and use the remaining tobacco to fill the pipes. We were probably around 10 years old at the time. As I got older I began to snitch Luckies or filtered L&Ms from my father’s pack. I enjoyed smoking but quit when my first child was born. After nearly 50 years I still get an urge once in a while, but considering the price of cigarettes today, I’m glad I kicked the habit. If we were supremely bored, which was rare, we would wander over to my friend Vinny’s front yard to watch his grandfather and the other old, Italian men in the neighborhood play a card game called Brisk. I think the game may have originated in Italy, but no matter, the old guys played it with gusto. We would sometimes bust their chops and imitate the Italian phrases and exaggerated gestures they used as the game became animated. One day their patience with us ran out, and Vinny’s grandfather innocently asked us if we wanted some cherries. Of course we took them not realizing that the unique taste of the cherries resulted from the homemade Italian liqueur they had been soaked in. As we began to feel the effects of the booze and stagger around, the old men nudged each other and laughed at us. Lesson learned: never mess with old Italian men. We rode our bikes everywhere, usually staying within a ten block radius of our block, but sometimes we took “road trips”. 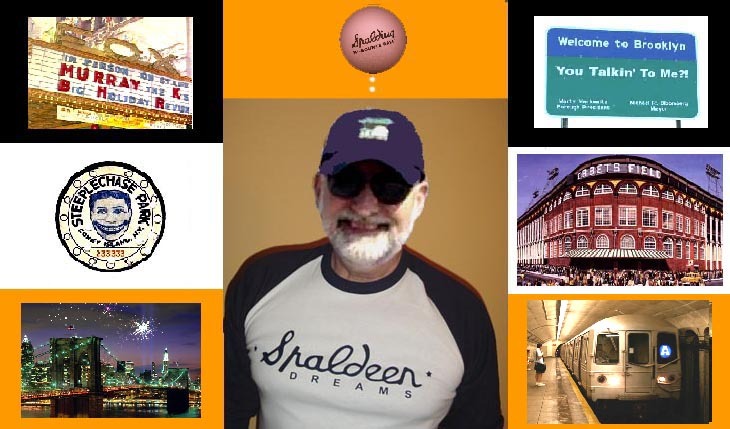 We would go as far as 5-10 miles from home to places like Ebbets Field, home of the Brooklyn Dodgers, in the hopes of seeing a real live ballplayer. Another popular destination was Howard Beach in Queens where we would go fishing off the Broad Channel bridge. You need to appreciate that to get to these places we had to traverse some of the most heavily trafficked streets in the city. No helmets, no training wheels, and no fear. We carried air pumps and kits to repair the occasional flat tire because we knew that if our mothers ever found out about these little jaunts, we were dead meat. What’s interesting is that our parents rarely knew of the crazy and sometimes dangerous things we did. They weren’t on top of us every minute we were out playing. There were rules that had to be followed like coming home at dinner time and not getting into any trouble that would embarrass the family, but we were pretty much on our own. We were out of their hair and keeping ourselves amused…that was enough for them. What I didn’t appreciate at the time was how this freedom to grow up without someone telling us what to do every minute of the day would teach us self-reliance and the ability to make our own decisions, clearly not always good decisions, but ours to make and suffer the consequences. I think all of us who grew up this way have a decided advantage over today’s over-supervised, under-adventuresome kids.